DOUBLE POINTS THROUGHOUT THE EASTER WEEKEND: 18th-22nd April! For every £1 you spend on plants, pots and composts at Katie's Garden and Bridge Farm Plants we add 4 points on to your Flourish account. Collect 100 points and you can start redeeming them on the varieties of your choice from the Flourish range. Flourish card holders save all year round on our full selection of glazed and terracotta pots with no limits on how many you can buy. As a Flourish member you will receive emails with all the latest offers, ranges and nursery news. We will let you know about special events and pass on top tips to help your garden flourish! Keep an eye on your inbox for news of special double points and bonus points events, money-off vouchers and more. If you do not want to receive these emails you can select this option when you register, and can opt out at any time. Fill in a form at Katie's Garden Plant Centre or Bridge Farm Plants and we will activate a card for you there and then so you can start collecting points straightaway. You can also register and manage your account online using the link above. Whichever way you choose we will give you an introductory 10 points to get you started. The club is free to join and free to use. Install the Flourish app on your phone and use it to collect and redeem points in just the same way as with a card. From here you can add your personal details and choose a unique PIN. We will send a verification email to you and once you reply to this you will be good to go. If you decide you would also like a card we can issue you with one linked to your account next time you visit either Katie's Garden on Bridge Farm Plants. Available from Easter 2019 - 100 points each. Not for general sale! Alcea Chater's Mix - If, like me, you wish every July that you had planted Hollyhocks months ago ... this variety reliably flowers in the same year as planting, although it won't be as tall as those planted last autumn. 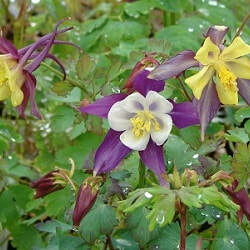 Aquilegia Mrs Scott Elliot - Defying the trend for ever dwarfer plants, a traditional cottage garden strain. 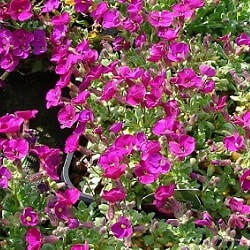 Aubrieta Katie Red Shades - A new seed-raised strain we could hardly resist! 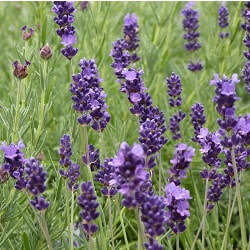 Lavandula Bandera Purple - A French lavender which has proved very hardy on the nursery, very vigorous and free-flowering. 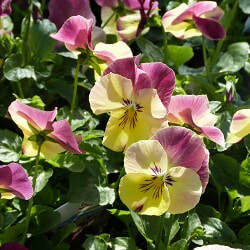 Pansy Cool Wave - A truly trailing pansy, Strawberry Swirl is a new colour this season. Papaver nudicaule 'Champagne Bubbles' (Iceland Poppy) - A modern F1 hybrid showing the benefits of selective breeding, flowering for much longer than traditional varieties. 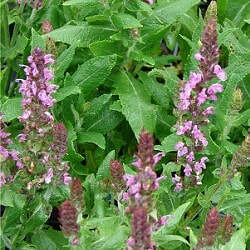 Salvia nemerosa New Dimension Rose - A popular cottage garden perennial for us for several years. 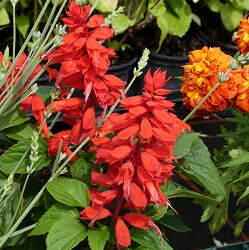 Salvia roemeriana Hot Trumpets - Slightly tender perennial which is enjoying global warming, now performing reliably in UK gardens with fantastically long flowering period. Our Terms & Conditions are here. We will not pass on your details to any other parties, and will not use your details for any other purposes.